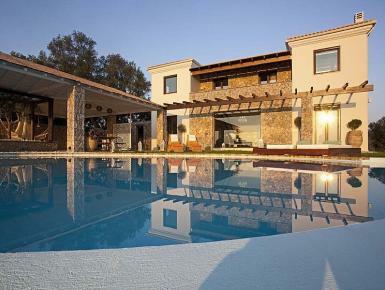 The beautiful Corfu Villa - Villa Piedra - offers luxury accommodation, exceptional design, tranquillity and total privacy. Just 5 minutes drive from Corfu Town, on the beautiful island of Corfu, Villa Piedra is a 3 bedroom Villa Home combining state of the art facilities with the comfort, elegance and style of a traditional Mediterranean Villa. Relax by the pool in your own private retreat, yet be minutes away from the restaurants, galleries and shops of cosmopolitan Corfu Town with its Venetian buildings. The beautiful beaches of Agios Gordios, Perama and Benitses are just a short drive from this luxury villa and the convenience of local shops is just a few hundred metres walk.